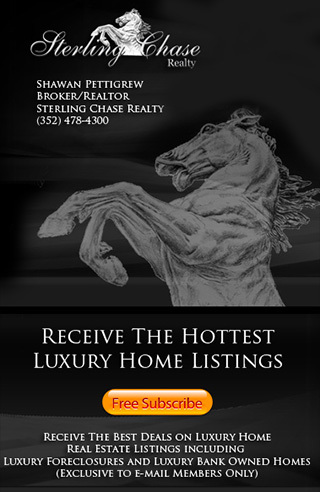 Sterling Chase Realty represents Sanford Luxury Homes & Real Estate For Sale. If you are thinking of selling your home, house or townhome in Sanford, FL, let me help you get the highest and best price in the shortest amount of time with the least inconvenience to you. My team and I will prepare a Comparative Market Analysis for your home and help you establish the proper asking price. I will make a personal visit to your home to evaluate its marketability and give tips and suggestions to help you get your highest and best price on the terms that are agreeable to you. Do you have other Sanford, FL real estate questions, interests or concerns? Do you just need a second opinion? I have been a licensed Broker / Real Estate Agent in the State of Florida since 2000. Take advantage of my many years of experience in the real estate business for a personal consultation. I can assist in Short Selling your home, relocation issues, senior housing options, multifamily / investment properties, zoning issues, staging, property tax appeals, and much more. I pride myself on offering creative real estate solutions, no matter what the situation or circumstance. Whether you’re a first-time home buyer or looking to purchase that Multi-Million Dollar Luxury Estate I can help you find the home of your dreams.